If you've amassed a collection of physical audio CDs that you now want to transfer to your portable music player, then you will need to extract (or rip) the audio on them to a digital music format. Windows Media Player 11 can extract the digital information on your physical CDs and encode it to several digital audio formats; you can then transfer the files to your MP3 player, burn to MP3 CD, USB drive etc. CD Ripping allows you to listen to your entire music collection while keeping the originals in a safe place; sometimes CDs can suffer accidental damage that can render them unplayable. From a convenience point of view, having your music collection stored as audio files enables you to enjoy all your music without the hassle of wading through a stack of CDs looking for a particular album, artist, or song. Before continuing this tutorial, it is imperative that you do not infringe on copyrighted material. Distributing copyrighted works in the United States by any means is against the law and you could face being sued by the RIAA; for other countries please check your applicable laws. The good news is that you can usually make a copy for yourself as long as you have purchased a legitimate CD and don't distribute; read the Dos and Don'ts of CD ripping for more information. The latest version of Windows Media Player 11 (WMP) can be downloaded from Microsoft's website. When you are ready to begin, run WMP and click on the small arrow icon which is situated below the Rip tab (highlighted blue in the above image) at the top of the screen. A popup menu will appear displaying several menu items – click on More Options to access Media Player's rip settings. Where the music is stored. The type of audio format. What actions to take when inserting a CD and when a rip session has completed. By clicking on Change you can specify where your ripped music is stored. You can choose MP3, WMA, WMA Pro, WMA VBR, WMA Lossless, and WAV audio formats by clicking on the small down-arrow icon underneath the format heading. If you are transferring the ripped audio to an MP3 player then check to see what formats it supports; choose MP3 if unsure. This is a useful feature to use if you have a lot of CDs to rip in succession. You can tell Windows Media Player to automatically start ripping an entire CD when it is inserted into the DVD/CD drive. The best setting to select is Only When in the Rip Tab. Choose this option in conjunction with the above setting if you are converting a batch of CDs; it will save you time having to repeatedly press the eject button after every CD has been processed. The audio quality of the output files can be adjusted via a horizontal slider bar. There is always a trade-off between the quality of audio and file size when dealing with compressed (lossy) audio formats. You will have to experiment with this setting to get the balance right as it varies drastically depending on the frequency spectrum of your audio source. If you're encoding to a lossy WMA format then choose WMA VBR which will give you the best audio quality to file size ratio. The MP3 file format should be encoded with a bitrate of at least 128kbps to ensure artifacts are kept to a minimum. Once you are happy with all of the settings you can click Apply followed by the OK button to save and exit the options menu. 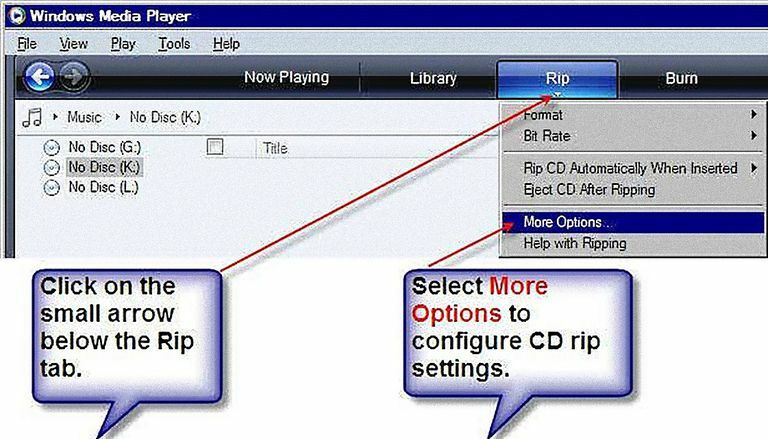 If you have configured Windows Media Player to automatically start ripping audio CDs as soon as a CD is inserted then all the tracks will be selected; to select only certain tracks to rip you can click on the Stop Rip button, select the tracks you want, and then click the Start Rip button. In contrast, if automatic ripping is turned off then you will need to either select the entire album (click on the top checkbox) or individual tracks by clicking on each track checkbox. To begin ripping your CD, click on the Start Rip button. During the ripping process, you will see a green progress bar appear next to each track as it is being processed. Once a track in the queue has been processed, a "ripped to library" message will be displayed in the Rip Status column. Now it's time to verify that the files that have been created are in your Windows Media Player library and to check to see how they sound. First, click on the Library tab (highlighted blue in the above image) to access Media Player's library options. Next, look at the menu list on the left pane and click on Recently Added to verify that all the tracks you want have been successfully ripped to the library. Finally, to play an entire ripped album from the start, double-click on the artwork, or for a single track, just double-click on your desired track number. If you find that you ripped audio files don't sound great then you can always start again and re-rip using a high-quality setting.